How would you like to help change the world? How, you ask? You’ve heard me speak of FreedomInk365. 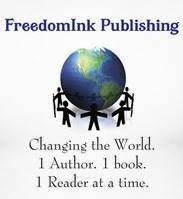 Founded by Katandra Shanel Jackson, FreedomInk is a small publisher in Atlanta, Ga. But their vision is much greater. They want to promote reading, not only in Atlanta, but in the world. Just how do they do that? Every year, FreedomInk participates in World Book Night, a Halloween Blog Hop, and a Holiday Book Drive to gather books for children. Last year, they went to Pearl, Mississippi for Read 365. This promotes not only reading, but the FreedomInk authors. This year FreedomInk will go to Harlem,NY. This is where we come in. In order to send FreedomInk to Harlem, to spread the word and inspire others to read, they need money to help get them there. They are asking for donations. Not just money, though that is nice, but also moral support to spread the word. Now for those of you who want to help monetarily, here is the link. Or you can buy a T-shirt during FreedomInk’s t-shirt campaign. Go here for details on ordering your very own “Changing the World” tee. Each one is customized just for you. So help FreedomInk365 change the world. 1 author, 1 book, 1 reader at a time. Thanks in advance. Your help is appreciated.